When I started writing I thought it would be fun. And it was, until I decided to get serious about it and see if I could sell some books… to entice someone besides my friends to read them. My publisher laid out a marketing plan that includes Twitter, Facebook, Goodreads, public appearances, book contests, and blogs. The writing is still fun… the marketing not so much. He believes blogs are the most important marketing tool, and based on my website activity I’d have to agree. Of around ten thousand clicks on my website last year, about 80 percent were on blog links. So, writing blogs is important, and he would like one every two weeks. But there’s the time it takes to maintain all those marketing avenues, and then there’s the little matter of coming up with a new idea every two weeks. And hardly least of all, when do I have time to work on the next book? So the idea of talking about bad reviews seemed easy and not very time consuming, and it was going fine until I ran into the problem: half of my books didn’t have any bad reviews. The worst review for Missing Boy was 3 stars and said: “OK book.” Cold Justice has one 4 star review: “As usual, a fast moving fun read without a lot of blood and guts. Very entertaining. 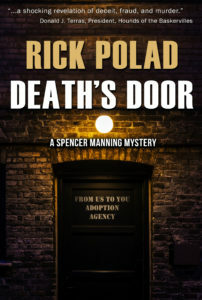 Rick keeps one engrossed in the story.” And the latest book, Death’s Door, has all 5 stars. Now, given that it is pretty recent, it only has thirteen reviews, so I’m giving it some time. I’m sure a bad review will pop up somewhere along the way. Don’t get me wrong, I’m only complaining a little about good reviews, and only for the purpose of that blog. It slowed down the process and left me wondering about the irony of it all. I lose reviews that I assume would have been good because of the roadblocks thrown up by Amazon who filters submissions—my relatives (same last name), a certain person with the same address, or the girl I shared a soda with in the fourth grade. If you’re feeling sorry for me and planning on helping out, I appreciate it, but I’m not doing any more blogs about bad reviews. So, if you’re dying to write a bad review I have some books I can suggest.